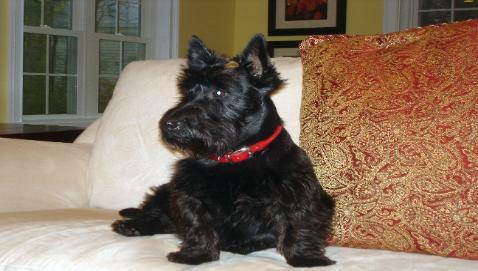 Search and adopt a Scottish Terrier near you. The Scottie is a short-legged British terrier, one of several wire-coated go-to-ground terriers developed in the Scottish highlands. The origins of these terriers is obscure, but it is fairly certain that they all arose from the same basic stock. Progenitors of the fiery Scottie were sent to France's monarch by King James I of England in the 16th Century, but as late as 1882, three different terriers were exhibited as Scotch Terriers. Like all terriers, the Scottie has a mind of his own. Unlike his cousins, he is reserved, quite particular in his choice of people, and steadfastly loyal.